At the 2006 Reliant Houston dogshow, our area rescue coordinator asked us to man the rescue booth with Kodi. Kodi was only months old, but he had always been the perfect gentleman—calm and never getting upset over anything. He is great at working the crowd for treats!! At the show, there was a young boy, around 10 years old, in a big, bulky wheelchair. His parents were pushing him through the aisles. He seemed mentally challenged, but I had no idea what was wrong with him physically. Kodi walked away from a small group of people that were feeding him doggie treats and led me over to the little boy. He was very insistent that we go see him. Kodi was almost a year old and is a pretty big boy. He was able to lay his big ole head right onto the kids lap. At first, I was a bit nervous because I didn't want the parents to be afraid, so I asked if it was okay. They both nodded their permission. I knew Kodi wouldn't hurt a fly, but I realized that those parents didn't know that. The little boy started patting Kodi on the head, HARD. Instead of getting upset by the child’s awkward roughness, Kodi remained perfectly still and even managed to sneak in a quick, slurpy kiss across the boy's face. The little boy started giggling. I thought it was cute, but when I looked up at the mom, she had tears in her eyes. Being slightly confused by her reaction, I am sure I had a puzzled look on my face. That's when she looked at me and said in a shaky voice, "Our son is autistic; he doesn't laugh". Well, you can imagine my reaction at that point. My eyes filled with tears and a lump developed in my throat. That is the moment I knew I'd use Kodi around children as a therapy dog. It never ceases to amaze me how unbelievably intuitive and loving these big babies can be. Kodi has a gift for "knowing" and I hope to finish his TDI and CGC as soon as possible. Kodi is now out on the road campaigning, but has already been requested to begin working in our local neurologist office with children with neurological issues. I can hardly wait to start taking him into the office to work with neurologically challenged children and adults. I'm so very proud of my big boy. Brenda, your local animal rescue services may have CGC and TDI classes. That's a place to start, or you could hit the yellow pages under dog training and just call and ask around. Good luck with your wonderful mastiff! I belong to the mastiff group on yahoo, and i thought I would check out your website! I am crying! I would really like some info on how to get a mastiff into therapy training. 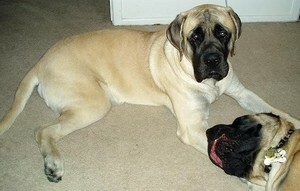 I have one rescued mastiff, and I am hopefully purchasing a female puppy, whom my breeder says is a solid beta. Any info you could get me would be great!